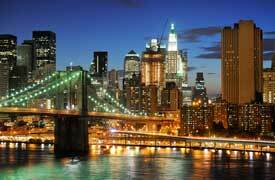 One of the most fantastic, interesting cities in the world is New York, the "secret capital" of America. Watch musicals on the world's most famous entertainment mile, the Broadway, have fun in the Central Park... Discover the magic of the city that never sleeps. Or are you looking for your lucky streak? Then go to Las Vegas! Try to get rich in casinos or watch the shows of stars like Elton John or David Copperfield. And if you love to be outdoors and feel the nature, go to the Rocky Mountains or the Niagara Falls and enjoy one of the world's most fascinating wonders of nature. Visit Mexico city, one of the world`s biggest capital cities with 8 million inhabitants. Get fascinated by ancient Maya pyramids and temples, for example the Kukulcan in Yucatan, which is part of the UNESCO world heritage. Canada is also a great place to be. Said to be a mixture of the best aspects of european and US American lifestyle and culture. Especially in our cold, rainy winter many people dream of escaping to the sun. Palm trees, cocoa nuts and the waves of the ocean - what a paradise! And paradise is not too far away: go to the Caribbeans and enjoy the sunny side of life.